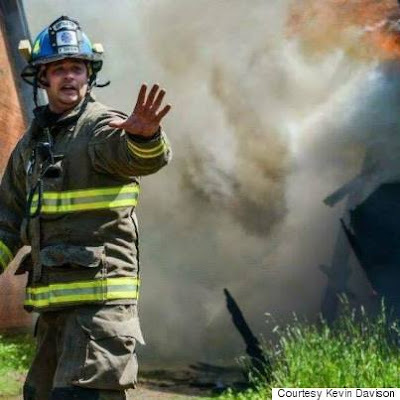 Wounded Times: PTSD First Responder Carries Heavy Burden "When Those Sirens Are Gone"
PTSD First Responder Carries Heavy Burden "When Those Sirens Are Gone"
Kevin Davison is a volunteer firefighter. First responders are ordinary people, but they're faced with the extraordinary challenges everyday. Nova Scotia firefighter and paramedic Kevin Davison knows exactly what it's like — he has spent decades rescuing people, but also faced tragic loses. The gruesome scenes from his job often keep him awake at night, and at times he can't shake them off during the day. Though he's never been diagnosed with post-traumatic stress disorder (PTSD), Davison says he identifies with many of the symptoms. "There have been times I've been to a major accident on the highway and it's taken me days to get my sleep back in order," Davison told The Huffington Post Canada. "Some of the things that you experience kind of stay with you." After decades as a paramedic, Davison now focuses on his music career and volunteers as a firefighter in New Minas, N.S. He says music can be an escape during stressful times. "I can forget about all the bad things that have happened, and just do music. I find it very therapeutic."